1024 oscillator elements with envelope generators and a filter module on an ant-sized chip? The classic Odyssey didn’t have all of that. That’s why that instrument had a lot less on board, though it made up for it with its transistors, resistors and diodes all carefully soldered, wired up and manually adjusted. That’s why the beast rocked so much. We took a really long look under the hood. And meticulously rebuilt the thing. Okay, so we didn’t exactly piece it together from the original components, since we thought it would be nice if you could afford it. But on the computer. On the inside, we made sure to build in all of those little imperfections that made the original Odyssey sound so sweet. And we coupled that with the latest hardware, which made it possible us to squeeze 12 Odysseys under the Prodyssey ASB’s gleaming exterior. Each of these has two oscillators with sync, variable pulse width, and envelope control. LFO with sample & hold generator – of course, this isn’t a sampler but a tricked-out sound mangler with that authentic Star Wars touch. 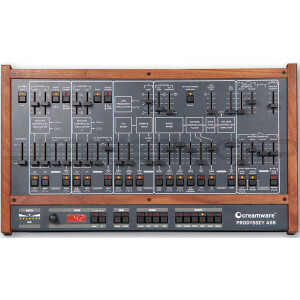 Filters with the characteristics that made the Odyssey the synth of choice for every European soundsmith: slightly cutting but also electric, and if need be, those soft and sparkling chrome formica quantum tunneling sounds. Plus, Filter-FM. The two envelope generators are capable of going head to head with not only the VCA but also the oscillators. And, of course, the modulation capabilities that the typical chromatographs and slide rules of today’s NASA Laboratories can’t give you any more. Is that enough for you? OK, no need to keep reading. You can find our dealer list here. For those of you who still want more, well, we really might have gone a little overboard for you guys. We totally revamped the modulation capabilities. We built in a Minimoog TM (!) filter. Added touch sensitivity. Aftertouch (of course!). Pedal connections. Envelopes with adjustable velocity. MIDI-Clock. FX section. And we were bold enough to leave our imprint on the Prodyssey ASB’s front panel. We thought that black and white looked cooler, to match the other models in the ASB series. But beneath it all gleams a series of authentic remakes of hand-made oscillators. Which scream so loudly that they can be heard on Proxima Centauri.